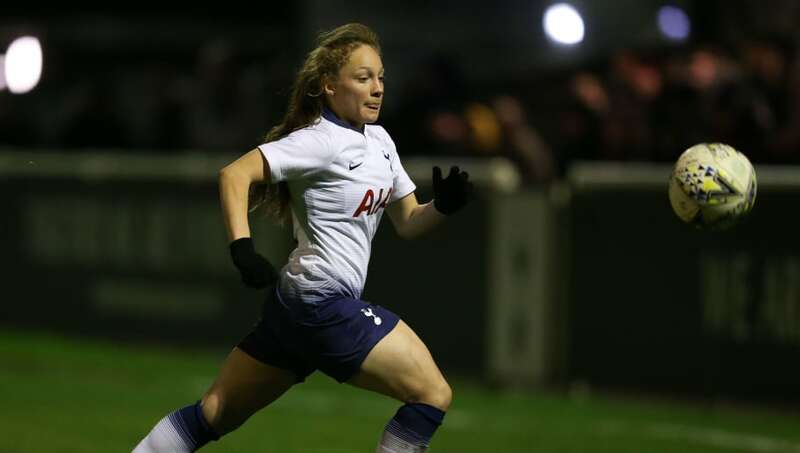 A wonderful individual goal by Angela Addison secured Tottenham a dramatic 96th minute win over Leicester City to keep their hopes of a FA Women's Championship title alive. Substitute Addison's goal was the only one in a tight and nervy encounter that ensured Spurs keep their five point lead intact at the league summit. Ladies and gentlemen, we give you tonight's winning goal! A mazy run from the left hand side saw Addison dance her way through three defenders before firing low into the bottom corner to send everyone at the Cheshunt Stadium into raptures. The goal continued a remarkable run for Karen Hills side, who have now gone 20 matches in all competitions without a draw. The three points keeps them ahead of second place Manchester United, who are scoring for fun this season as they put four goals past Sheffield United to keep themselves breathing down the north London side's necks. A goal inside the first minute from Katie Zelem set the tone before Lauren James strike and Ella Toone's penalty had the visitors in a commanding position heading into half time. It was a professional and mature second half display from the Red Devils with the win rounded off shortly after the restart courtesy of Mollie Green's 51st minute effort. It’s been a good week! With two games in hand over the league leaders - and just five points adrift - coupled with the form United find themselves in, they will be confident they can close the gap before the season's close. In their last three matches they've accrued nine points, kept three clean sheets and scored a staggering 14 goals, with their goal difference standing at an unbeatable 59. Elsewhere, Charlton Athletic lost ground in their bid for a top two finish after a disappointing 2-0 defeat away at Aston Villa, despite the home side having a player sent off. A win would have seen the visitors close the gap on United to two points but they fell short at Boldmore St Michael's after two first half goals continued the Villans' fine form in 2019. Sophie Haywood grabbed the opener, picking out the top corner with a left footed finish in just the 14th minute. Kerri Walsh grabbed the second 32 minutes in, as Villa's high pressing won them the ball back for Walsh to slot home. The goal scorer was given her marching order in the second half. however, after lashing out at an opponent with 20 minutes remaining. As a result, Villa now remain unbeaten in 2019 and remain seventh in the table. The final match of the round saw bottom club Millwall secure bragging right over fellow capital city side London Bees at Leigh Sports Village with just their first win of the season. The visitors took the lead after just seven minutes as Daisy McLachlan's screamer found the top corner from the edge of the area. Undeterred, the Lionesses responded through Annie Rossiter just before time with a stunning effort of her own. After pressing and probing the home side got their just rewards as Evie Clarke's low finish under Sarah Quintrill gave them the lead with 20 minutes left to play. Not to be outdone by Rossiter's goal, Clarke got her second to seal the points in magnificent fashion, producing a sublime overhead kick to seal the three points.